In a tasty chunk of synchronicity, Nat and I both find ourselves at a bit of Sunday loose end and desirous of an outing of some sort. Preferably – nay, compulsorily – involving food. So we agree to meet about halfway between our respective abodes – at Bluestone American BBQ on Sydney Road in Coburg. Truth is, we’d been planning to hit this joint for a while. In the meantime, unsurprisingly, it has been written about and covered rather extensively. 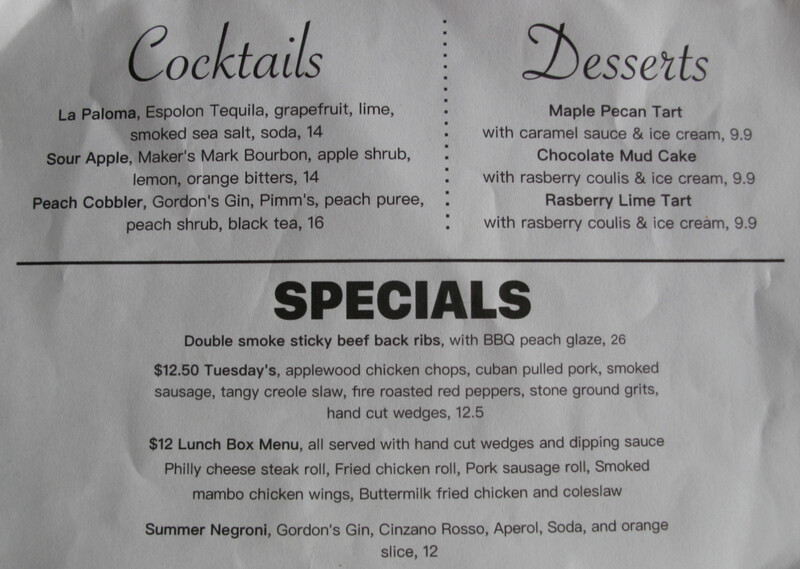 Perhaps, I muse, the recently introduced $12 lunchbox menu may be a new wrinkle (see menus below) for me to cover. But that plan remains stillborn in the face of Nat’s hungry determination to have brisket – which appears in none of the boxes. That’s very cool, my friend – I’m happy to go with your flow. So we end up having a right royal barbecue blowout in the form of the Pitmaster Pick No.2 ($39.90 a head). 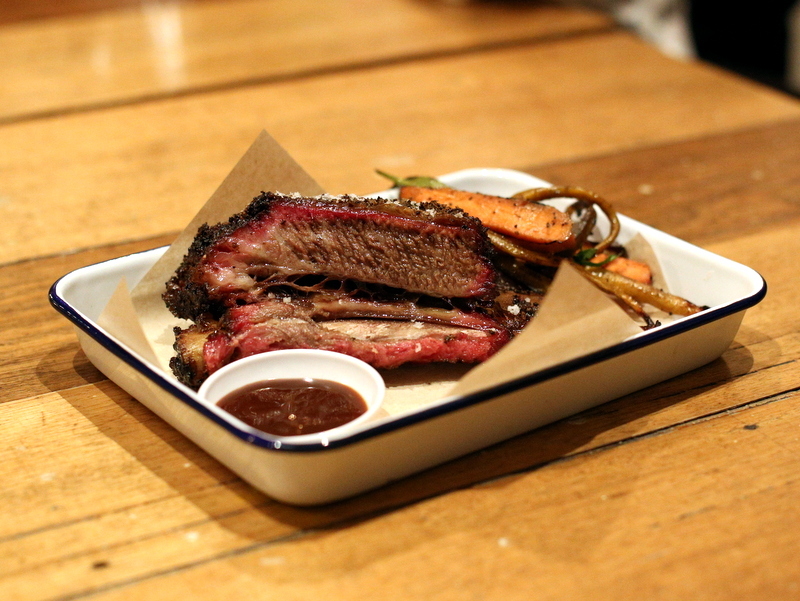 Bluestone American BBQ is done out in suitably rustic style. 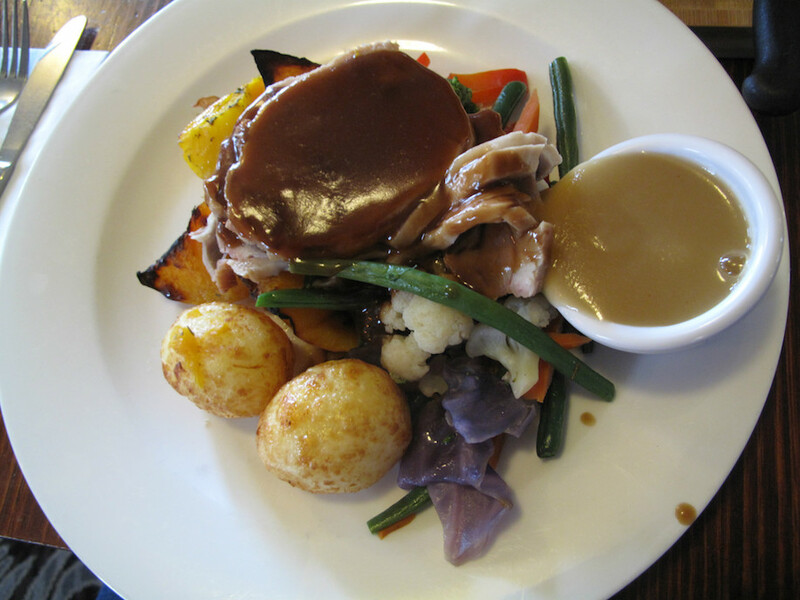 We find Sunday lunch an ideal time to visit what is proving to be a very popular eatery, though it fills up steadily as we enjoy our meal. 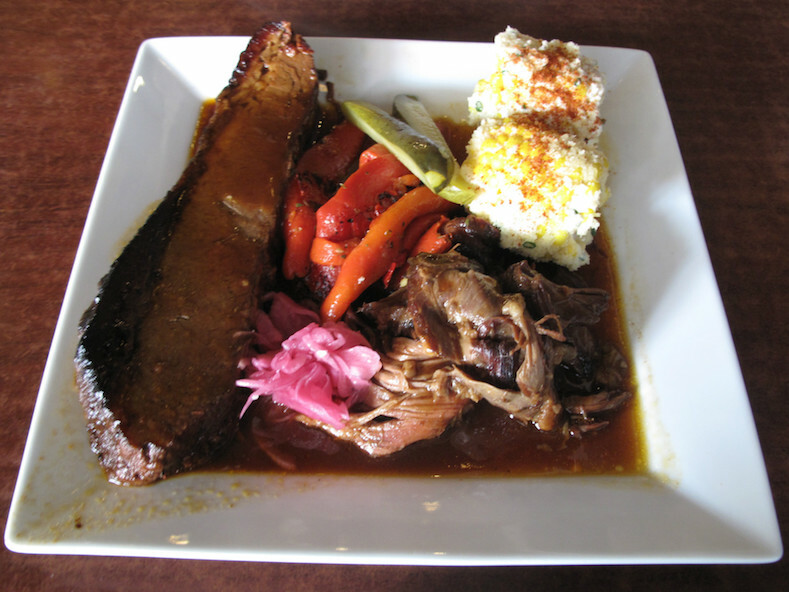 … Texas-style brisket, fire-roasted red peppers, pit-braised pulled lamb, BBQ street corn, with two kinds of pickles besides! This all very excellent barbecue. And there’s heaps of it. 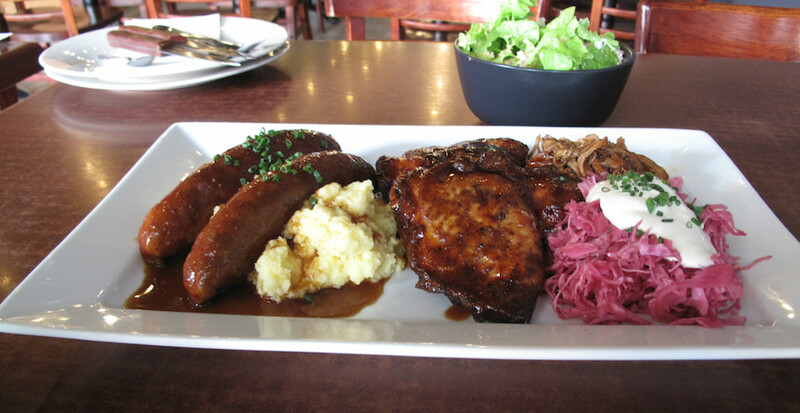 So much so that the $40 price tag – exorbitant by our usual Sunday lunch standards – impresses as good value verging on a bargain. It’s tricky to pick standouts – if anything, I love most the sticky chicken. The meat is mostly heavily sauced, with Nat wishing – at least a little – that some of the meat had been left a bit more austere. Instead of the brisket slices with which we are familiar, here it is served in one big handsome slice, and seems braise-like. The sides, too, rock our lunch, though I am never going to be a grits fan. The one dud is the corn. In a meal so otherwise rich, these cobs – slathered in some kind cheesy concoction – simply don’t fit for us. Salt, pepper and butter would be the go, we reckon. 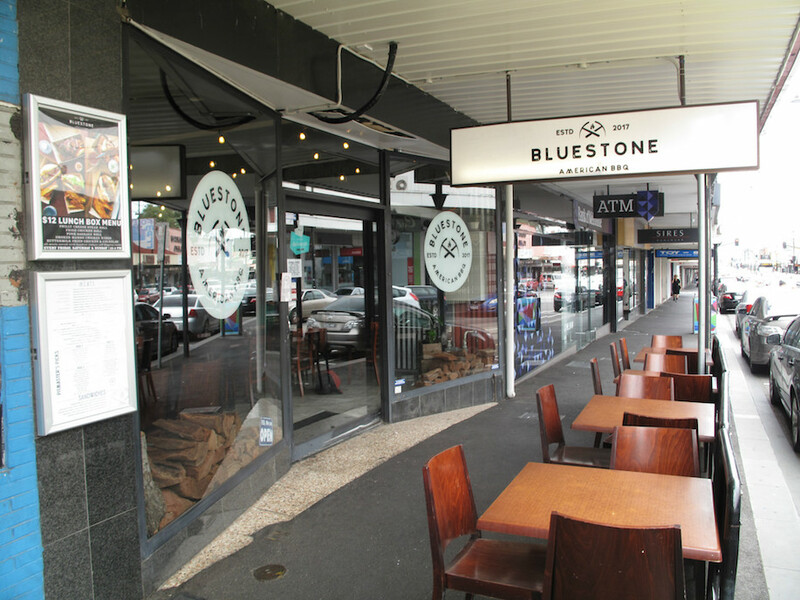 Bluestone American BBQ is warmly recommended by us as a fine, meaty establishment, especially as it located in a suburb not noted for such food and where parking is not a problem. In addition to the Friday-Saturday-Sunday lunchboxes, on Tuesdays is offered what looks like an excellent $12.50 deal of chicken, pulled pork, sausage, slaw, peppers, grits and wedges. 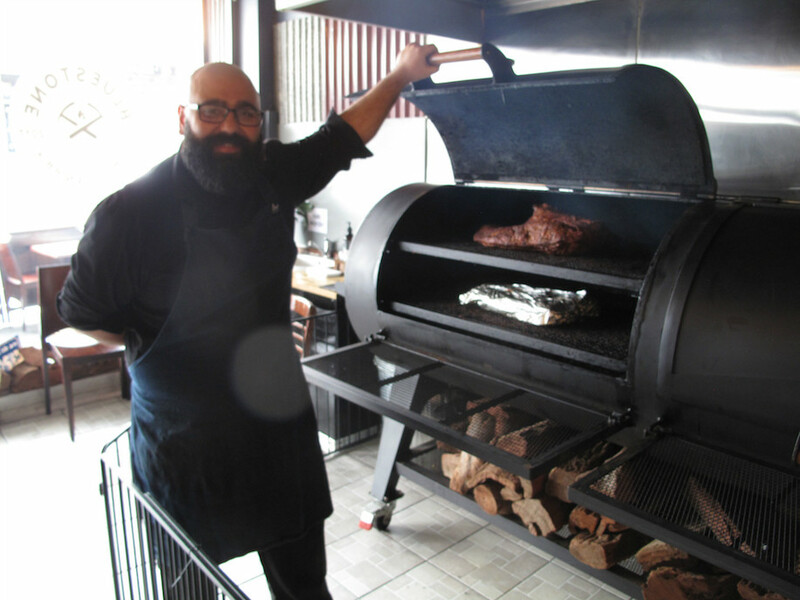 Check out the Bluestone American BBQ website here. 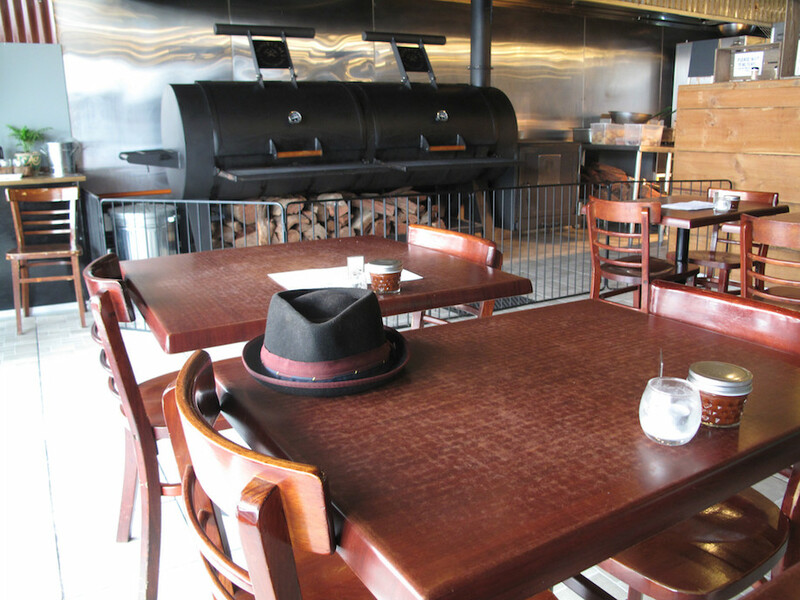 At what passes for a dining room at Tex-Oz Smokehouse, you’ll feel gravel underfoot. You’ll sit on plastic chairs while eating at tables apparently made of something like packing case wood. You’ll eat from cardboard containers while using plastic cutlery. 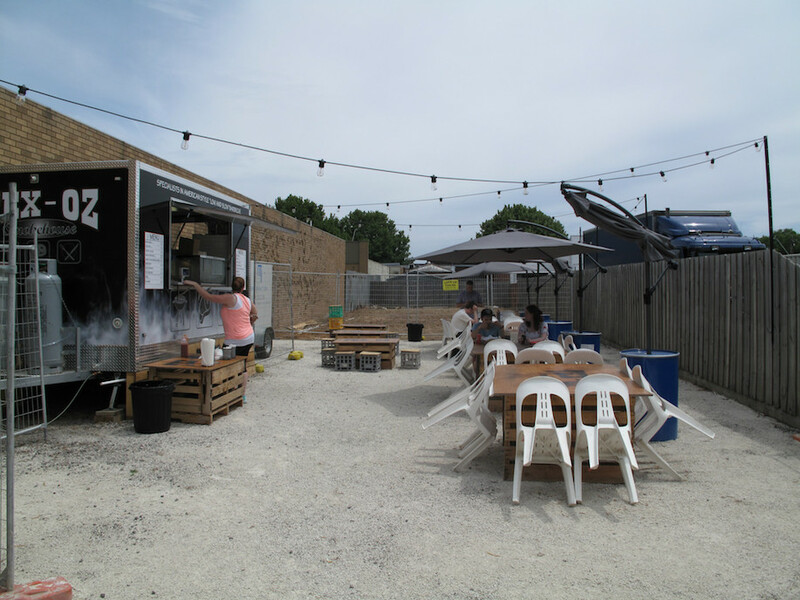 You’ll order from a food truck parked on an otherwise empty lot. We think all that’s absolutely grand. 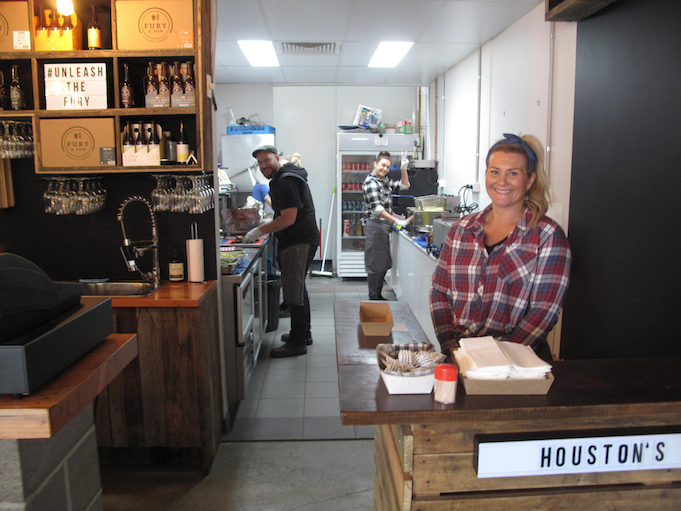 Because in being what and how it is, Tex-Oz give Melbourne life to a great no-frills BBQ tradition that has previously gained little or no traction here. Sure, in Memphis, Virginia and Texas, BBQ of many kinds can be enjoyed in grand and/or chic and/or hipster settings – and you’ll often pay a high price for doing so. But just as important – arguably even MORE important – are the cheapo roadside stands and shacks found throughout the land that cater to the quick-fix needs of regular folks not seeking a big night, but instead simply a good feed – at the right price. 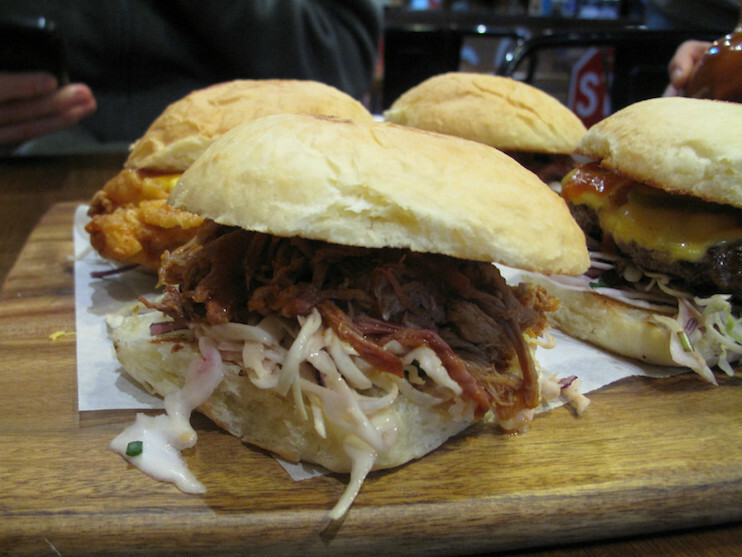 And, yes, Tex-Oz Smokehouse does right in the money stakes, too. 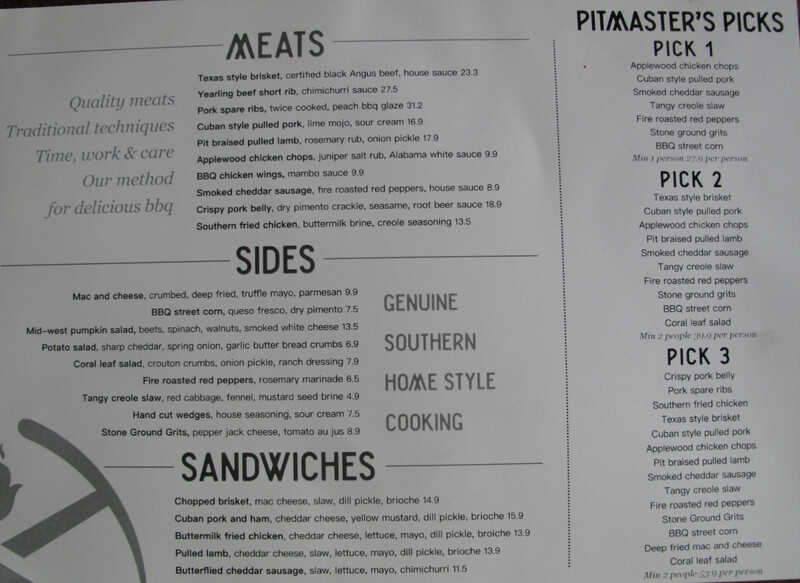 Equally appropriately, the menu (see below) is compact. A CTS team of three – myself, Bennie and Nat Stockley – enjoy a very nice, post-heatwave Saturday lunch. 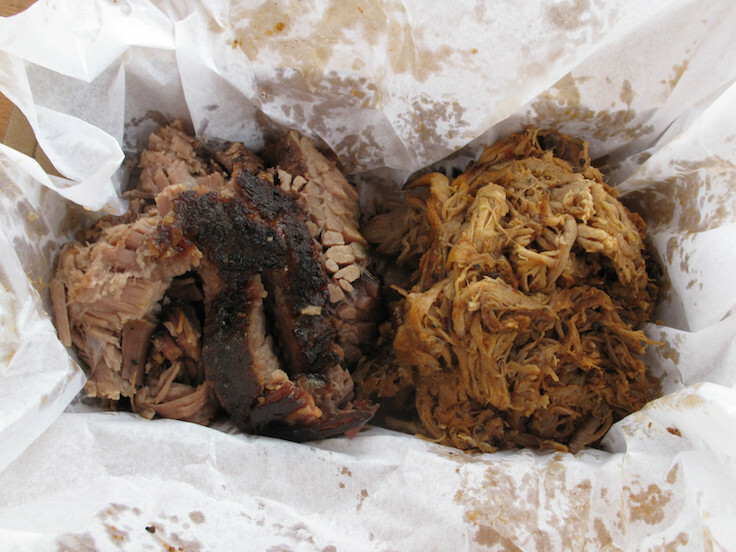 The smoked brisket and pulled pork – sold at $6 for 100 grams and seen here in 200-gram quantities – are excellent. The brisket, in particular, shines. There’s not a lot of smoke going on, but the meat is more tender and juicy than it photographs and more-or-less completely fat-free. And it goes fine with a house-made sauce that has a bit of a spice kick. The stranded pig meat is fine, too, enough to have me recanting my oft-expressed judgment that pulled pork is largely a tasteless, over-hyped con. 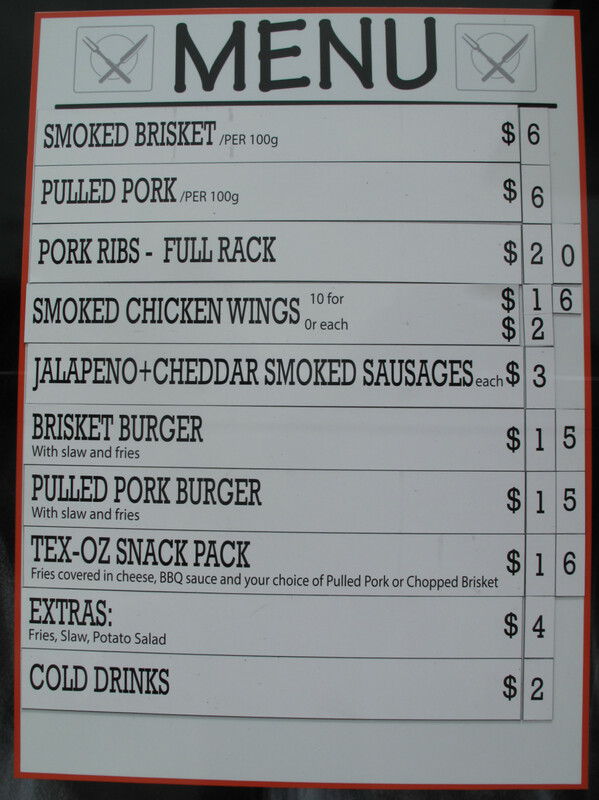 Bennie opts for the hybrid dish that is the Tex-Oz snack pack ($16), adorned in his case with more of that pulled pork. He likes it a bunch, though I’m guessing that while he’s enjoying his lunch he’s also reminding himself that, as previously expressed, he’s done with snack packs. 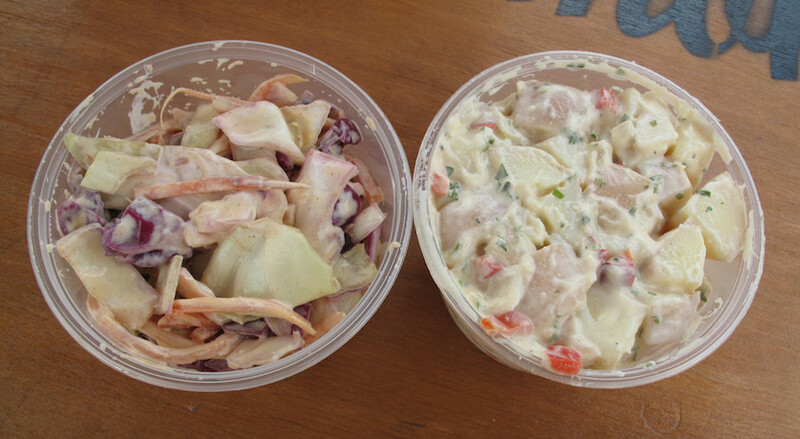 For sides, we get coleslaw and potato salad – big serves for $4 each. The slaw is fresh and crunchy and very rough cut, making it a little unwieldy in terms of the plastic implements we are using. 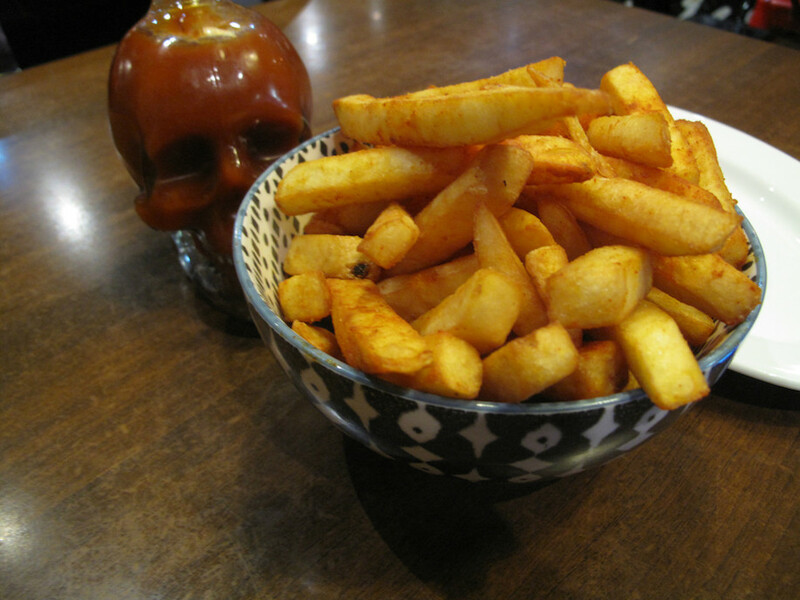 The spud concoction is heavily mayo-ised and doesn’t really hit the spot with us. 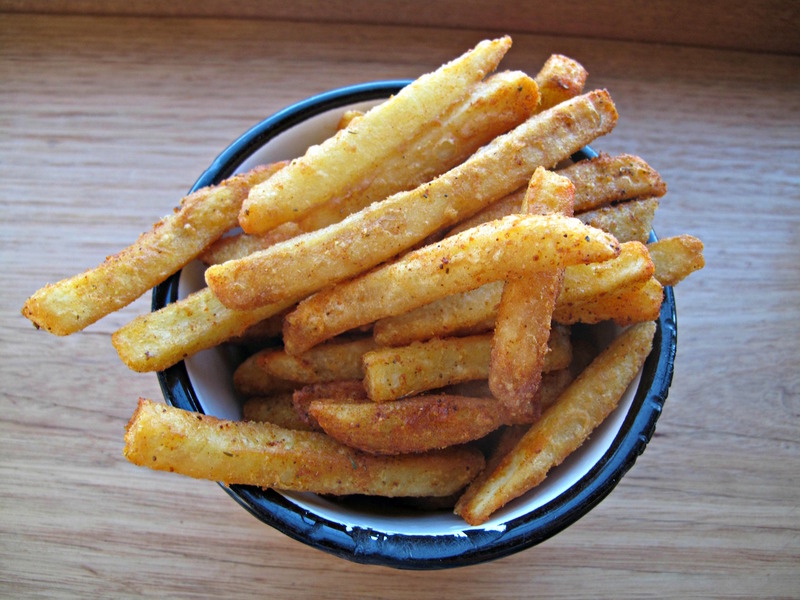 Nat – who also goes the pulled pork and brisket route – gets fries, which he tells me are overdone in terms of the salt. I am reminded of legendary story I was told about a very famous Texas BBQ joint at which I dined several decades ago. Apparently, when the management decided to introduce some non-meat items to the menu – you know, stridently non-carnivore fare such as white sliced bread, raw onion and pickles – the locals damn near caused a riot. So if the Tex-Oz accessories don’t quite hit the bullseye with us, we’re happy to embrace the “It’s All About The Meat” ethos and say simply: So what? 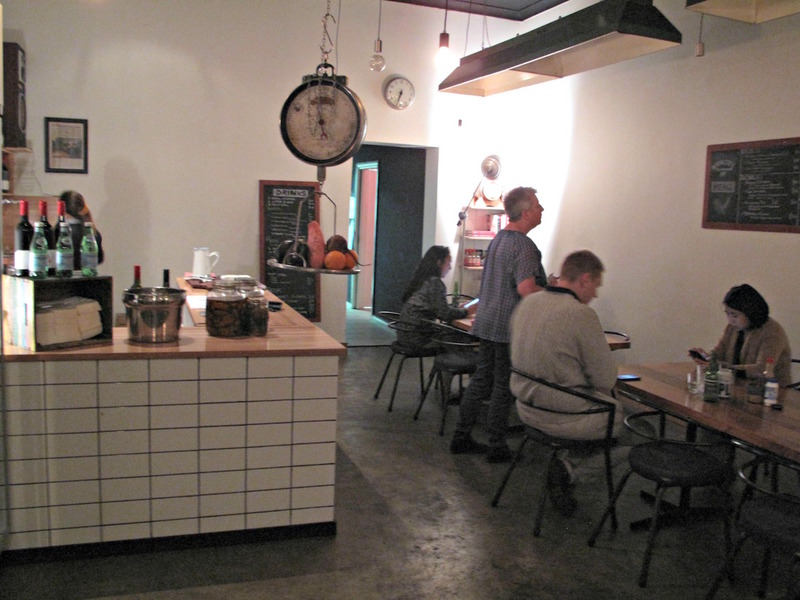 And in the meat sphere, this place produces the goods in an admirably no-frills manner. 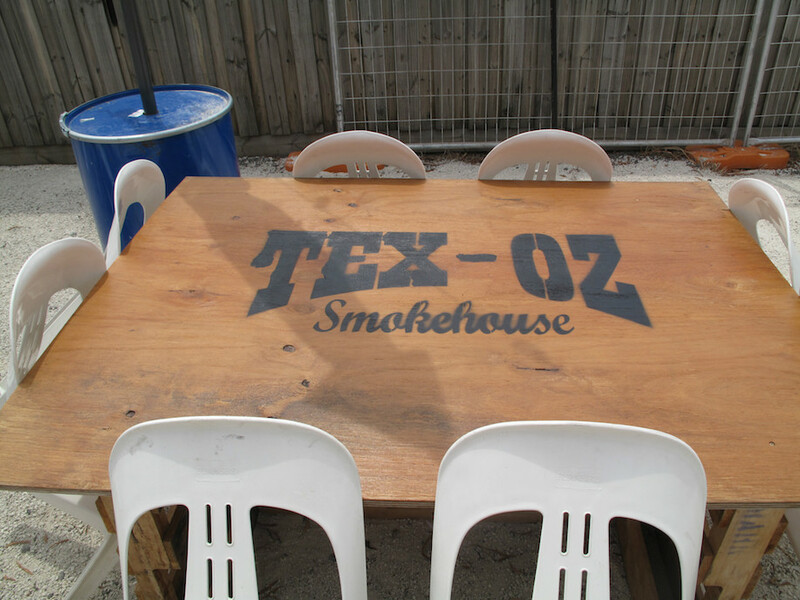 Tex-Oz Smokehouse is open from noon Thursdays through to Sundays. 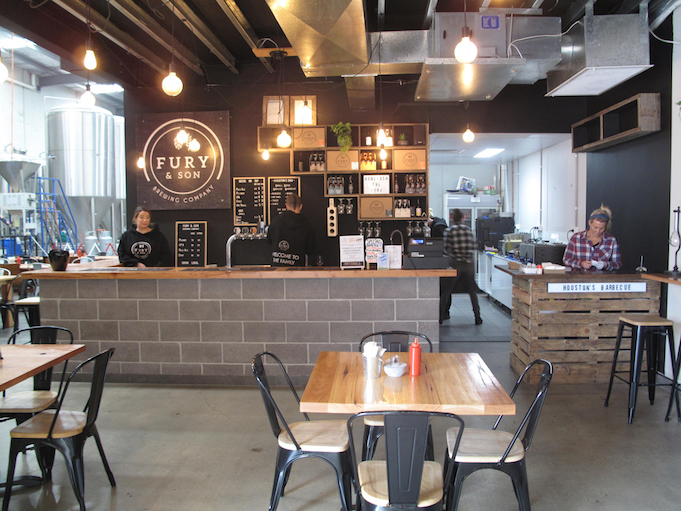 Burn City Smokers has been one of the hotter and more well-known names on the Melbourne barbecue scene for quite a while. But that has been based on activities of the festival and catering variety. 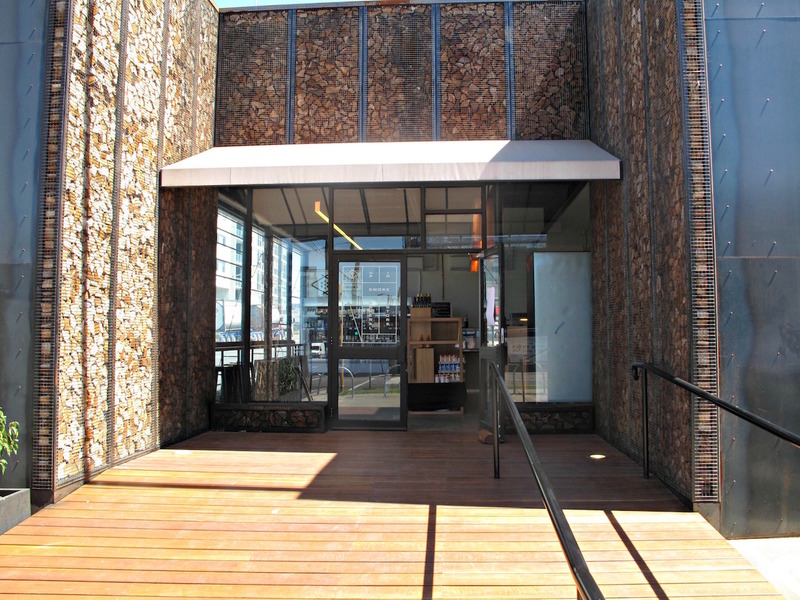 Now Burn City has a bricks-and-mortar thing going. Open for a few weeks is the shop front of the Vernon Street kitchen they’ve been using for a year or so. Replacing an Asian eatery, the place is done out in a way that manages to be both cozy and hipster spartan. 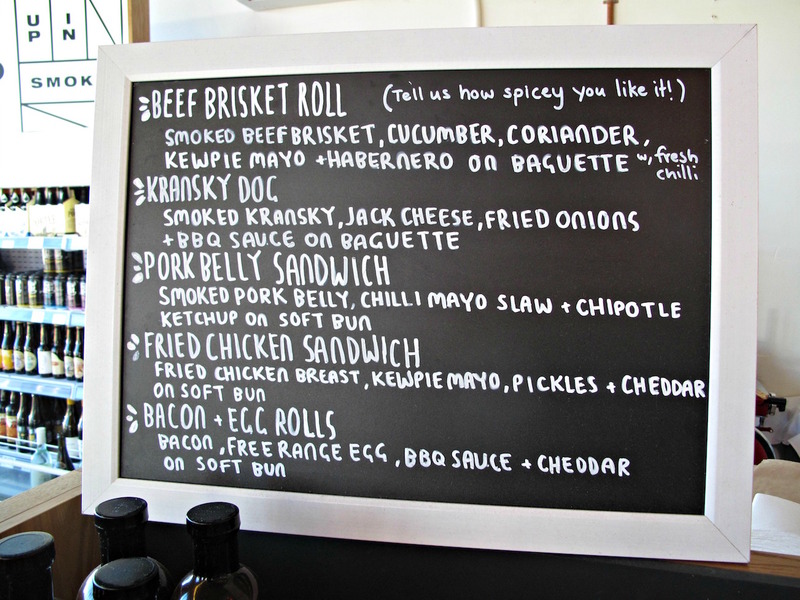 We’re told menus proper are on the way, but in the meantime a prominently displayed blackboard does menu service. It’s not a full menu and the outfit’s website (here) warns the food line-up will be changing regularly. See the list from which our Friday night meal was chosen below. 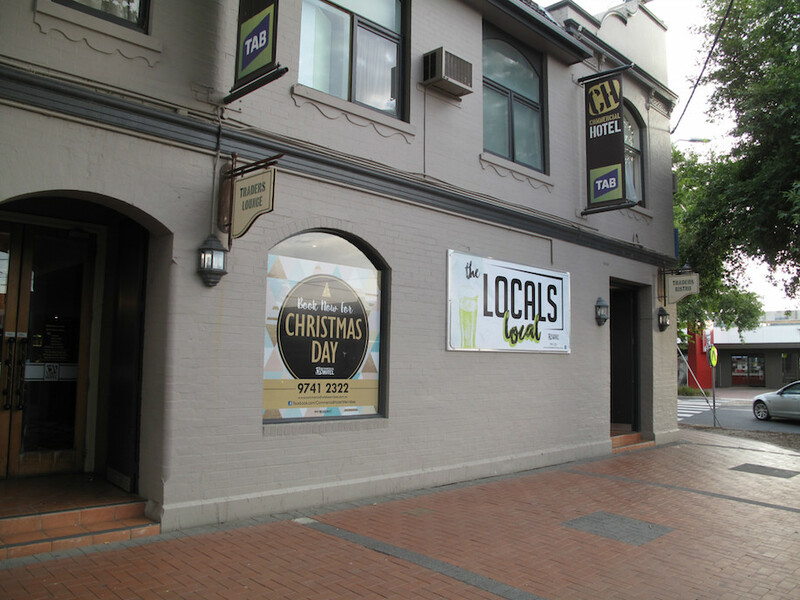 As well, the hours are limited – Friday dinner, Saturday lunch and dinner, and Sunday lunch and late lunch. Despite all these provisos, the place seems to have made many friends. Nat and I see plenty of Uber bags and other takeaways going out the door, and the locals with whom we share the communal table at the front are enthusiastic. As are those we chat to at an outdoor table as we’re on our way home. Do we share their enthusiasm? There’s a couple of mis-steps in our meal, but nothing that diminishes our happiness at the prospect of returning – especially as this is an evolving situation. 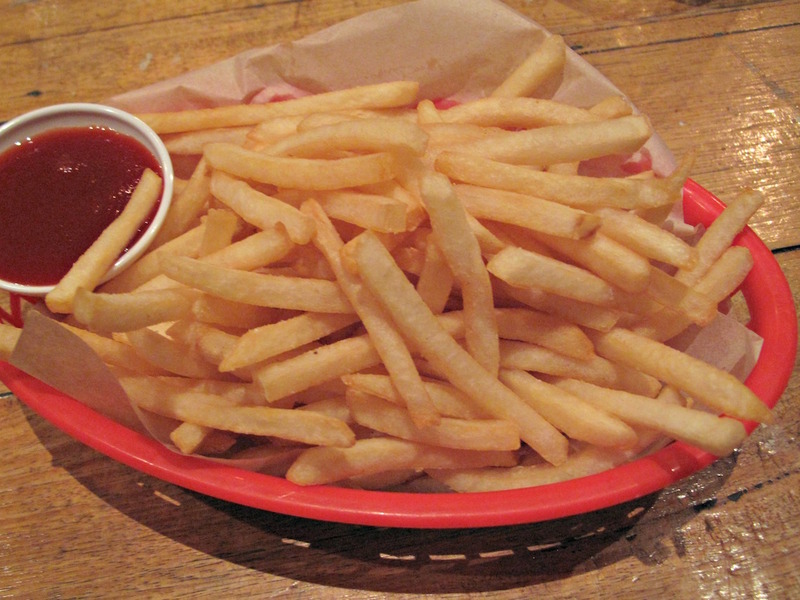 A side of fries ($7) is fine, though I wish they’d been hotter. 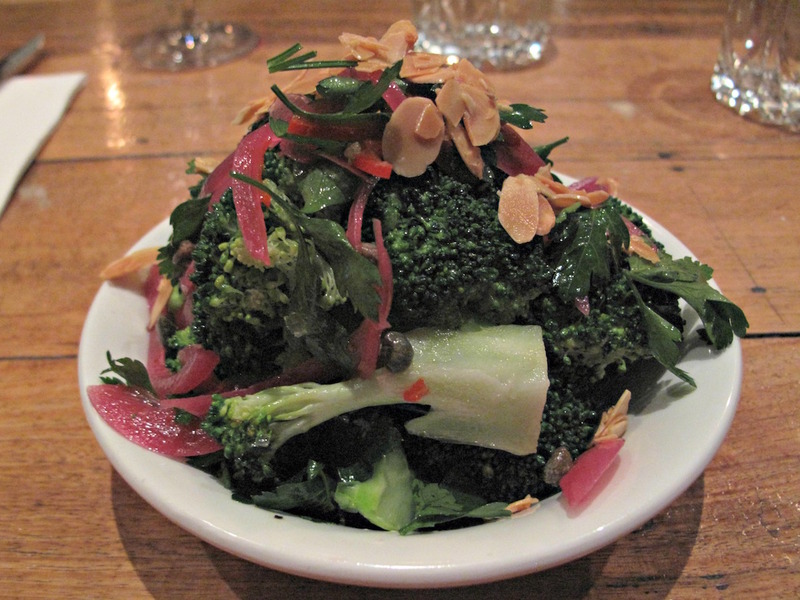 A salad of broccoli, almonds, pickled red onion, chilli and garlic ($7) is a great idea, but the sum is less than the parts. Largely this is because it doesn’t really come together as cohesive whole and the broccoli florets are too big and undercooked, for my taste anyway. Chicken and potato salad ($18) is good – I like what I eat a lot, though I don’t think Nat is as impressed. 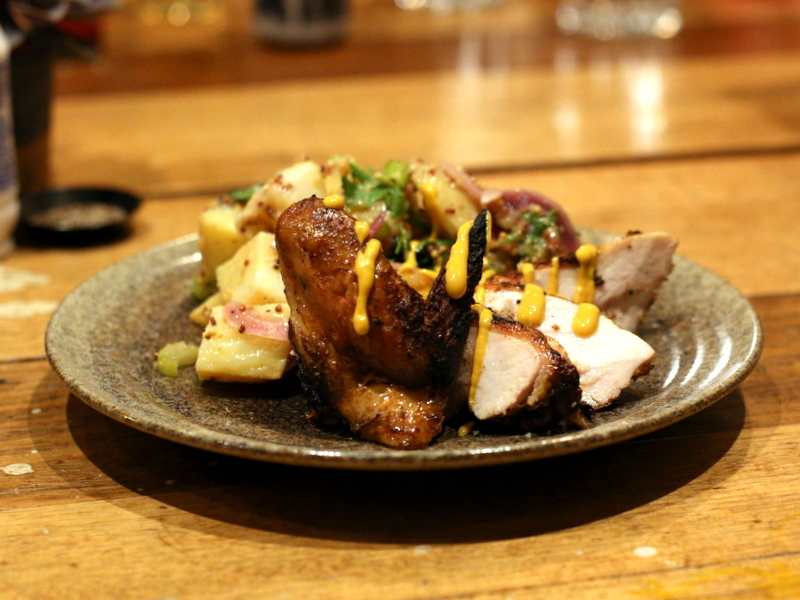 The smoked chook – even the breast – is moist and very good, while the seeded mustard-dressed potatoes are fine. Truth is, though, our chicken dish has been ordered merely for diversity purposes with a story to write. Had we been left to our own, non-blogging devices, we both would’ve ordered the beef short rib ($25, top photo). 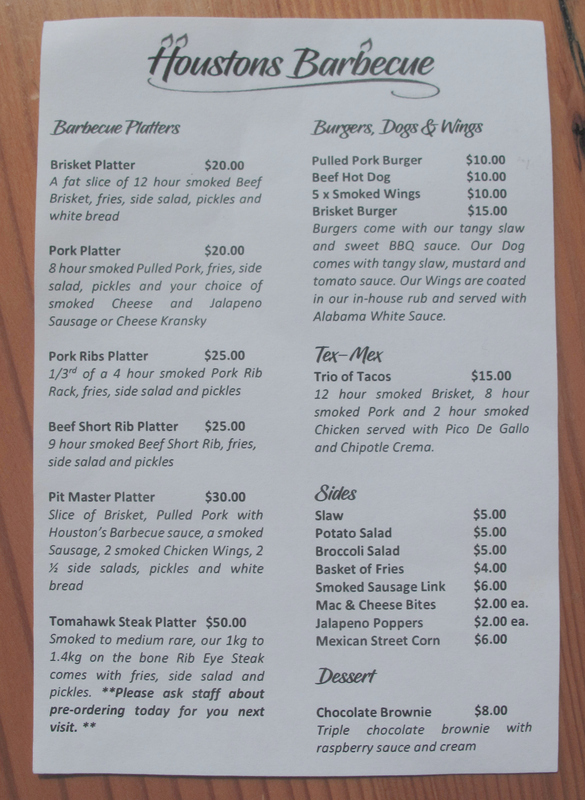 This is, on the list from we’ve been working, the sole, really heavyweight barbecue offering – aside from the “in bread”, cheaper sandwiches. 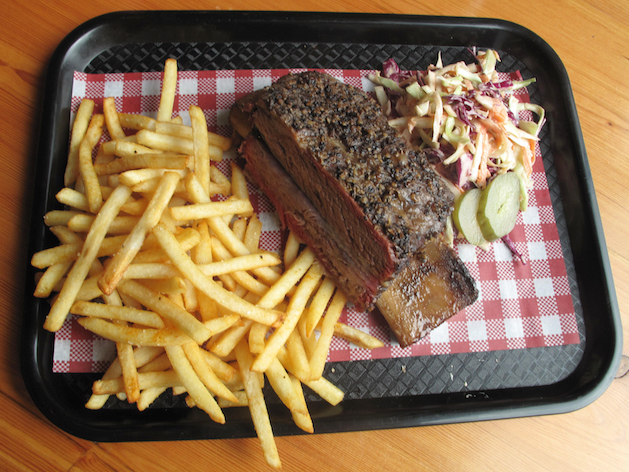 The “12hr smoked beef rib” is crusty, musty, salty and delicious, the meat tender and excellent. Accompanying, a bit unusually, are honey carrots. I love them, even though they, a bit like the earlier broccoli, are tad too much on the al dente side. For what’s it worth, the “in bread” efforts we see going by look very worthy of exploration. As do the baked pasta and bangers and mash being enjoyed by the friendly locals at our table. Nat describes the wine list as concise, considered and put together with assistance by someone with some knowledge. 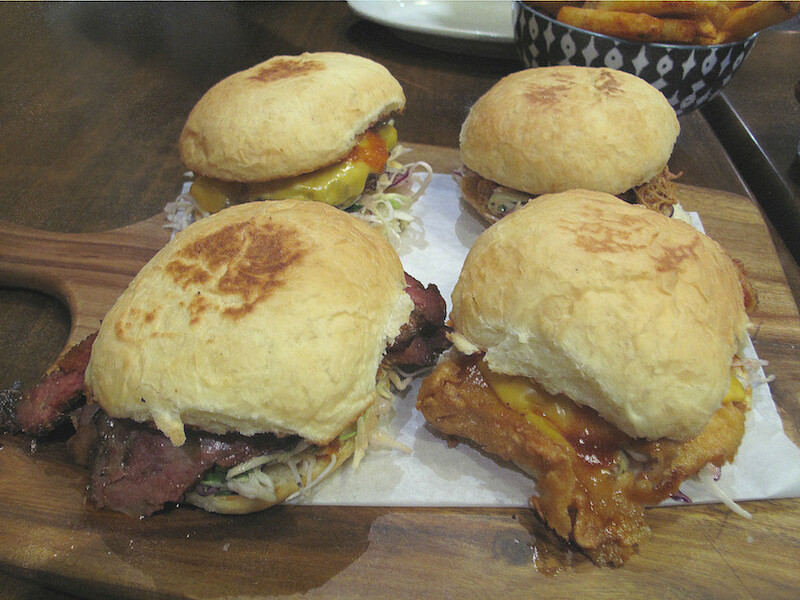 We checked out the dinner routine at Up In Smoke (28 Hopkins St, Footscray, phone 9689 8188) very early in the piece, and Bennie I have been back a couple of times – most recently to share very happily the Big Tray. 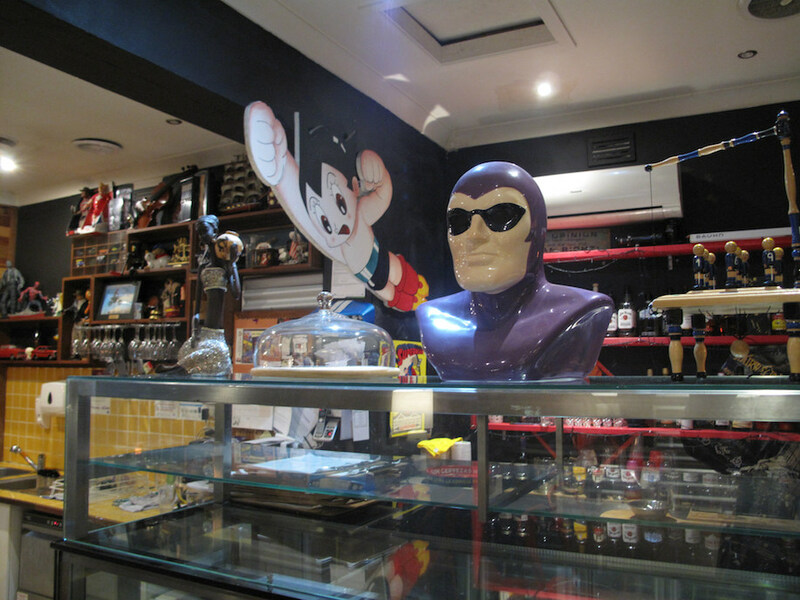 But it’s taken this long for me to try the lunch-time fare at the adjoining store. 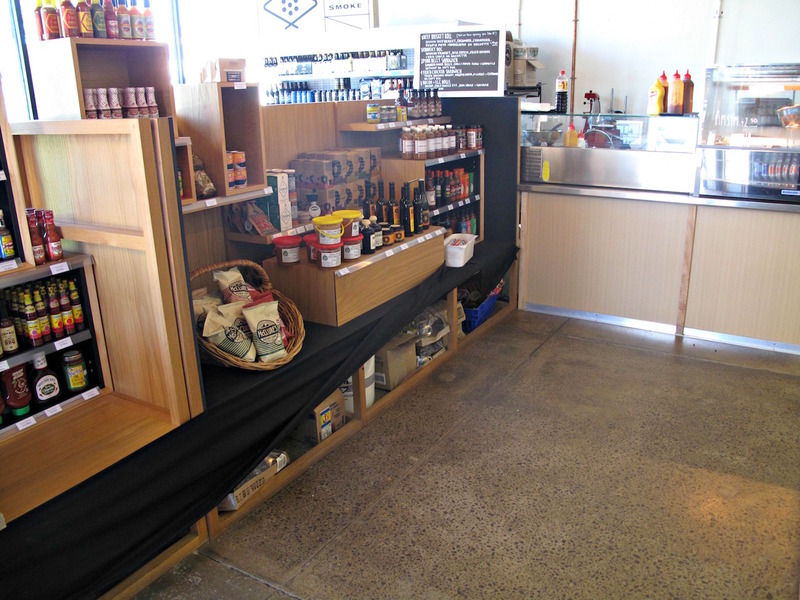 The shop has a range of beer, hot sauces, pickles and condiments and the like, and has a range of ready-to-toast sangers on hand. But I’m here with hopes of seeing how they integrate the restaurant’s barbecue fare with a more low-key, quick-bite and affordable lunch philosophy. What’s available is listed on a blackboard. Chips ($5) are fine, though I reckon halving the serve and charging $3 might better serve those wanting to top up their lunch orders without going overboard. 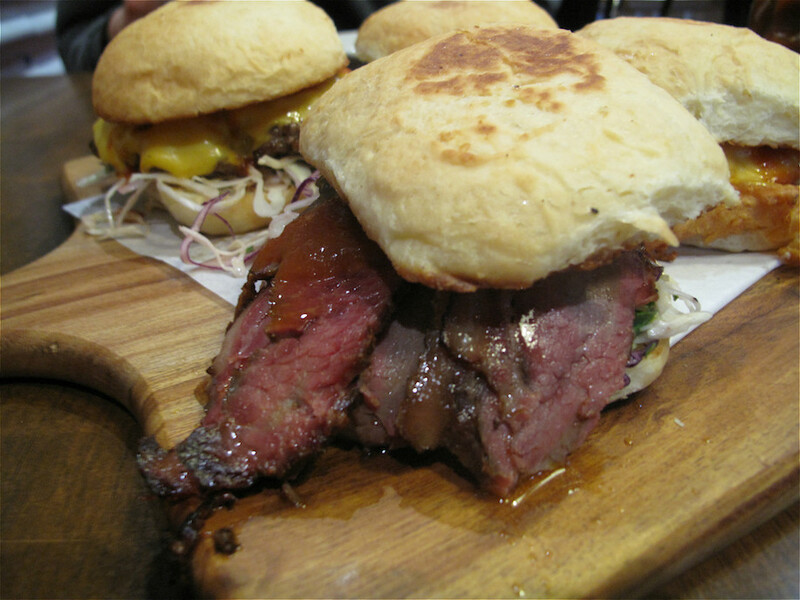 My beef brisket roll is a knock-out! 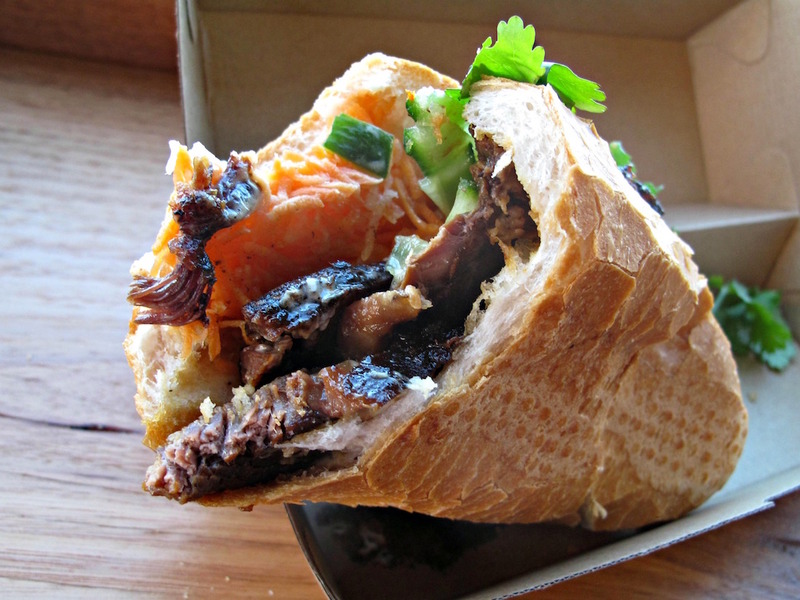 Here’s the thing – it’s something of fusion of the Up In Smoke barbecue thing and the banh-mi scene of a few blocks away. The banh-mi-style roll is stuffed with a very Asian, finely chopped coleslaw, cucumber batons, fresh red chilli discs and coriander. 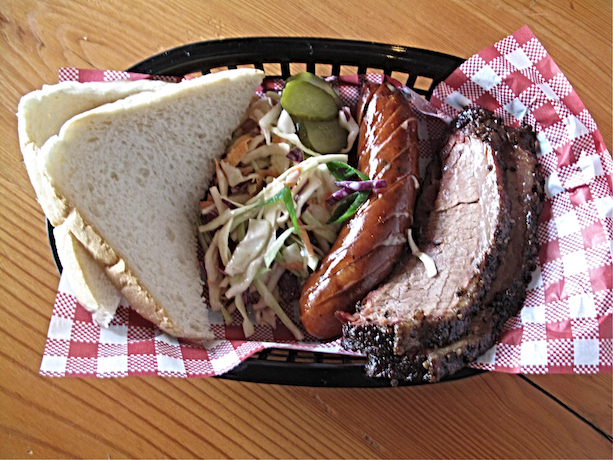 But it’s also handsomely filled with thick slices of very tasty and wonderful smoked brisket. 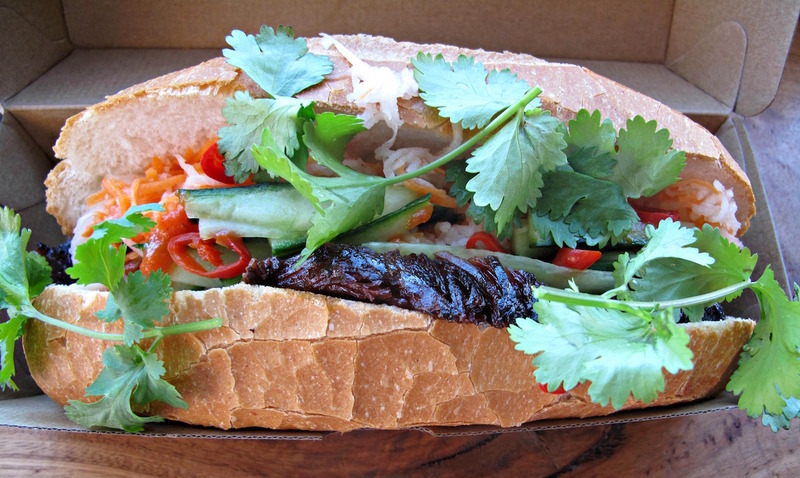 The price is $9 – which is, of course, almost precisely twice the going rate for Footscray central banh mi. But it’s also a good handful of dollars LESS than such a high-quality sandwich/roll would cost you in a hipster cafe. Given how much I enjoy it, I consider the $9 fee a bargain.